Wondering why would you need to download a Website? Well, with the internet not so cheap yet for constant access, that’s one of the major reasons why you would need to download the contents of a website. The process can help you save your website content of choice, for now, that can be read later. You can simply download the full websites and save them to your local drive. In order to download the content and cache the resources, you would need the assistance of something called, a website downloader. While it downloads the website of your choice, it also organizes the site by its actual link arrangement. Moreover, you can simply open one of the HTML pages in a browser and start browsing the downloaded website. Best of all, you can access the downloaded websites even in the absence of internet connection. From creating backups, or the option to migrate your website to a new server to learning website source codes, there are many advantages of these website copying programs. Here’s a quick list of some of the best website downloading software programs to get you started. Those looking for free software for offline browsing, HTTrack is one of the best website downloading software. Known for its ease of use, this software helps you download a website and saves it to your local directory. This helps construct all the directories periodically while it gets graphics, HTML, and other files directly from the server to the computer. The best part is, the software organizes the original website’s corresponding link-structure. All you need to do is to launch one of the pages of the mirrored website in in the browser, and the site can be accessed from link to link, in the same way as you would see it online. It can also restart paused downloads, and update a mirrored site that’s already present. Moreover, it can be completely customized and comes with built-in guides. WebAssistant Proxy Offline Browser is more of a trick than actual software. It smartly transfers all the web traffic and helps you create a copy of all the pages you browse, instantly and clearly. These files are then available to be used offline at your convenience. As you start using the downloaded web pages offline, you realize there’s no difference between the original content and the archive. While you can search your pages even in the absence of an internet connection, you can also use your bookmarks when offline. As you are back online the proxy servers updated the web pages that have been cached and new pages are included automatically. It also allows you to access the actual position of the downloaded pages, marks the links to resources of cache archives for quick access, lets you compare HTML pages from both internet and archive, and more. 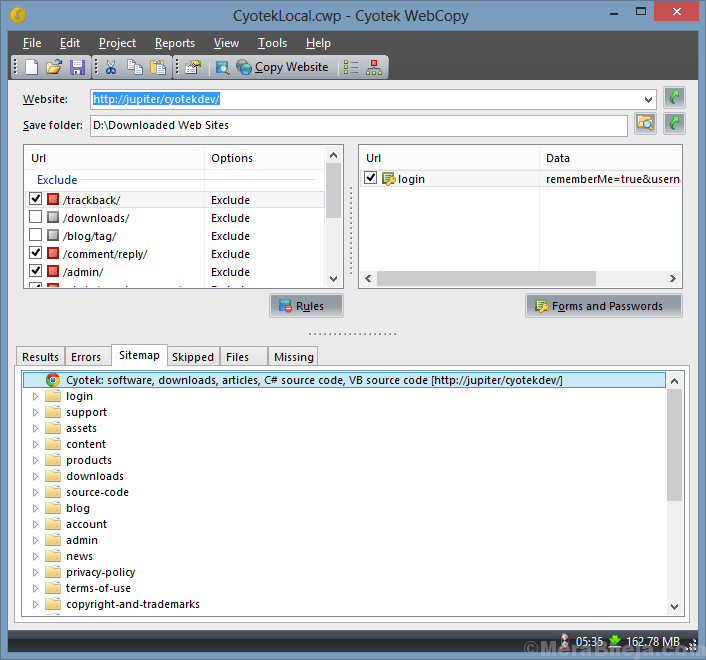 For those looking for a free website downloading software, Cyotek WebCopy is a perfect tool. It helps copy the website completely or partially on your local drive that can be viewed offline at a later date. The software runs a scan on the desired website and download all the content into your system hard disk. During this process, links to different resources such as, pages in the websites, style-sheets, or the images get automatically remapped to the local path. You can set your preference like which sections of the website can be copied and how using its broad settings. In short, the software evaluates the HTML margin of the website and would try to find out all the linked resources. Further, it downloads all the discovered resources, and goes on looking for more. This helps the program to crawl a complete website and download all that it sees in the attempt to build an acceptable replica of the website. Web2Disk for those who want to download a complete website to their PC. All you need to do is to simply enter the URL, hit the Go button, and the website is downloaded to your system that can be used offline later. It comes packed with a dynamic engine that helps configure websites in the same way as they have been downloaded. This is to ensure that all the links run straight from the hard drive. You can then access the website in the same manner as you did it while online. The best part is, you can check the downloaded website in any browser. The software allows you to replicate unlimited websites with no page or site limits. The websites downloaded are compatible with all browsers without exception. This helps your clients to access the website directly from the CD with no need for any added software. Moreover, you can even use the program to place your website on CD and distribute it offline. What’s more? It also downloads the preferred sites automatically and even saves them on a daily, weekly, or a monthly basis. With a free trial period available, SurfOffline is one of the best website downloading software programs around. This tool is quick and easy to handle, and that also enables you to download the full websites and web pages to the hard disk of your computer. It comes with some really dynamic features and an easy to use interface. Moreover, it lets the users mention the settings for the website download pretty swiftly. Once the entire website is downloaded, the program can be used as an offline browser. You can use Export Wizard to view the downloaded web pages in another browser. You can also replicate the downloaded websites to other systems using the Wizard so that you can see them later and even create websites that can be burnt to CD or DVDs. It can download up to 100 files at the same time and up to 400000 files in single project. Best of all, it can download the whole website including the images, audios, videos, and more. Moreover, it can also download web pages and websites that are password protected such as, with HTTP and FTP verification. Besides, thanks to the integrated browser and the cookies and sessions that let you download the websites that are password encrypted. GetLeft is another neat website downloader that acquires minimum free space compared to other software programs in the same category. It’s available as a free download that quickly downloads all the files from a website for offline browsing. The interface is available in 13 languages and requires some learning curve. But, with regular usage and time, it gets easier to handle. The software helps you save time by scheduling or restarting the downloads. Moreover, it simply recovers the updates. All you need to do is to filter the huge files out by type, or one by one over the site map before it starts downloading and accordingly, save disk space. The program is perfect for downloading small files or websites of any single variance. If you are looking for a convenient way to download your favorite websites, then NCollector Studio Lite could be your best bet. From crawling option for certain file types, or converting a website for offline browsing to just downloading a website to your local computer, the software does it all. Whether you want to use it for professional or personal purpose, NCollector is a comprehensive solution for your needs. Whether you want to surf the web offline in the flight or want to share a demo website without an internet connection, the software helps you download websites for convenient offline browsing. All the links of the downloaded websites are converted to local links. This way the websites will be available for offline browsing from the local computer. Another feature called the website crawler allows you to crawl through a site for links related to audios, videos, images, and more. It also allows you to download images using the major search providers like the Google and Bing images that are pre-set to download the desired images. Best of all, you can also download an entire website using the mirrored website mode that makes no changes to the local computer. Website Downloader as it’s called, helps you download all the links and assets of any desired website, effortlessly. The program is web-based and so, does not need to be downloaded separately or configure any software. You can start using right on your browser on any platform. You can easily use the program whenever you need to do download a website. It offers a quick preview of the downloaded website hosted on than e program’s servers without using the disk space of your computer. Once you have previewed the website, you can download the web page or the complete website. The program is extremely straightforward and easy to use. It comes loaded with advanced features like the ability to download a subdirectory or specific pages from a website. As the name suggests, the Website eXtractor extracts or retrieves the entire website or specific pages as required. It, therefore, saves your time and effort that you usually spend by researching online for hours. It will simply download the website or specific content to your hard drive. It comes with a helpful interface and separate settings. Once downloaded, you can view the website completely offline at your desired time and go through the pages swiftly. It comes with an integrated browser that enables you to check through all the websites online that can be downloaded and viewed offline. Website eXtractor can change the HTML source codes to related names that help you to shift the details to a CD ROM or any hard drive, conveniently. The program also boasts an amazing filtering feature that lets you select the documents by names and types, pre-configure the depth of downloading for the websites, and more. Website Ripper Copier is hands down one of the easiest website downloaders in the category, and also an extremely powerful tool. All you need to do is to input the website address and, in a few clicks, you can simply relax and enjoy the process. The dynamic application will download an entire website in just a matter of minutes, to the hard disk of your computer. You can then access the website offline whenever and wherever you want. It comes with a simple and easy to use interface that’s perfect even for the beginners. The control panel helps you through the entire process of how to download a website in a matter of seconds. While it lets you download thousands of files in one project, you can also download with 50 plus connections at the same time. Moreover, it saves the website documents with resumption option and also launches endless applications to download the websites simultaneously. From downloading a website with all source codes to retrieving images, videos, music, etc., and supporting protected cookies and session to cloning specific parts of websites using robust filters, there are many features to look for. Accessing the internet is a prerequisite these days, and it can get really challenging to access your preferred websites in the absence of internet connection. That’s when you need the best website downloading software that can rescue you during such situations. They would simply download either the entire website or the desired web pages for you to access them offline whenever and wherever you want. So, pick one of your choices and never stay behind.